The daily rhythm of life can, at times, pull us away from that which we most desire on this earth – connection, family, and the glimpse of a dream. All of that stuff is happening to me this week, and it dwarfs whatever daily gripes or complaints I may have had during this past year. It all started as my first year of teaching theatre finished in Saudi Arabia, and so we headed “home” to the USA for a blissful summer of family, friends, and functions. The festivities started when we arrived in New York and were whisked away to see my first grandson for the first time ever. Wow doesn’t begin to describe it. I shall, at another time, write more fully about what becoming a grandfather means to me, in addition to what it means to time–I’m not as young as I once was. But the joy that a four-month-old brings a family is palpable by the minute. Joy oozes from the cries, the coos, the laughter, and the smiles. Those smiles. Wow. Those smiles. I was overcome with joy and so proud to be a grandfather. I also made it home in time to witness the baptism of my grandson with the child’s other grandfather, from Korea, able to officiate over the ceremony with all of the family from both sides of the world present. It was a precious moment, good enough for mounting on a greeting card. I hadn’t seen any of my children in six months due to the nature of my work, so it was special to all be together to say the least. Now, my first week back in New York will end on a far more insignificant note: I, for the first time, get to see one of my plays produced in New York City. Love is not an exhaustible commodity. We know this because when a new person enters our lives, and we love them, we don’t have to release love’s pressure valve and let out a little love from our opposite end to compensate. Love is more akin to the expanding universe. It finds new voids and new spaces which weren’t there, and it doesn’t spread thinner and thinner like a tsunami eventually drying up on land. No. Love is as deep at its origin as it is at its point of expansion. That’s a marvelous thought, isn’t it? This topic has been on my mind, mainly because today I became a grandfather. My grandson, whom I will not be able to meet for a few more months, is a new and immediate object of my love. He hasn’t done anything to earn my love. He just has it by the virtue of being born to my daughter. Love is automatic. It’s not coerced. It’s not purchased. It’s there. Just like that, the number of people in the world that I love has expanded by one. What would the world look like if we all understood this truth about love and acted on love’s expanding principles? What downcast soul would be brightened? What violent act would be stopped? How many broken hearts would be mended? What would happen if we each expanded our reach of love by one more person outside of our regular sphere of influence? We would all be richer for it. This is my first lesson of being a grandfather. Look closely at this photo. What do you see? I see memories which will last a lifetime. Not for me, no, but for that family of aunts and uncles and nieces and nephews, mothers and fathers. if you look closely on the center left, you’ll see two children playing in the sand at the edge of the ocean’s waves. On the right is picnic-central, complete with thermoses, snacks, extra clothing, blankets, mother, father, and daughter. 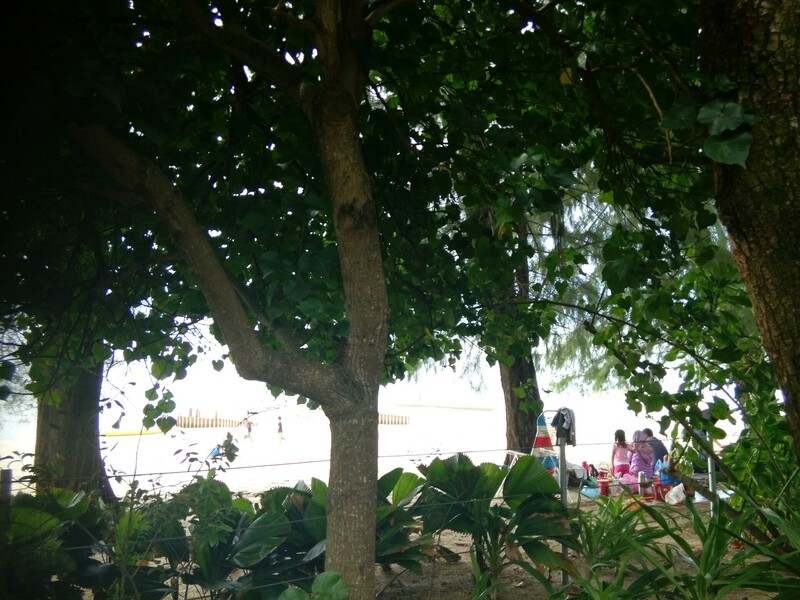 The kids will run back and forth from the water while the parents will chat in the cool of the shade, enjoying the holiday, Malaysia Day 2016. I took this photo from my usual writing spot, and the scene struck me so vividly that I had to take a photo of it through the trees. It was a lovely scene, the kind my family had when our kids were small. It’s a nostalgic scene, the kind that the Malaysian Normal Rockwell, if he exists, would happily paint and immortalize. I can imagine what these kids will think in thirty years. Remember when Mom and Dad would pack the car and we would travel over the bridge to Penang Island, weave through the bumper-to-bumper holiday traffic, making the 45 minute ride to Batu Ferringhi where we would picnic by the sea for the entire afternoon, coming home exhausted by midnight? Remember? Everyone, of course, will remember. And when these young kids have kids of their own, they too will come to Batu in search of the idyllic family day. It’s moments like these that we all have to hold on to. It’s moments like these that make me glad that I’m a writer. When was the last time you spent a few hours with some elderly folks whom were not related to you? Honestly, it had been a long time for myself until this past week. We were invited to talk about our life in Malaysia with a small group of elderly at a retirement home. After the wonderful talk and interesting dialogues that we had, we were invited up to one of the couple’s apartment and then they treated us to dinner in the retirement home’s dining hall. It was truly a wonderful afternoon. I’m sure they appreciated us coming out and talking with them, but I walked away from it appreciative for their long and dedicated lives for making the world a better place. The wife of the elderly couple is 97 years old and still as sharp as a tack. Her husband, the doctor, is her younger by a couple years or so. I noticed a couple of things during our visit. First of all, as a writer, I studied the couple to better understand how an elderly couple walks, talks, communicates with each other, and goes about living in their tenth decade of life and seventh decade of marriage. Wow! But please don’t think I was looking at merely specimen for study and research in order to make my writing more authentic. Not at all. I was humbled to learn of their sacrifices and their passion for serving others. I was thrilled to hear their stories – how the young doctor was studying his profession during the war years (1943) at the Cathedral of Learning in the University of Pittsburgh – how he was sent to post-war Okinawa to practice his profession – how when he returned he was introduced to a beautiful young woman at church – how he asked her to marry him but how she had to go home and pray it over before committing – and how they eventually settled into the Congo and then Cambodia and then the Congo once again, making memories, healing the sick, starting a family, and making an incredible difference around the world. I was blessed and challenged by this amazing couple. And it got me thinking. How many other amazing elderly couples or singles are sitting right in this retirement home? How many stories have yet to be told and might be gone forever if no one ever sits down to listen? How many stories throughout the country (throughout the world) sit idle because of the busy pace of our modern lives? We all need to make an effort to learn and listen from the generations which have gone before us. How much better would our world be if we turned off the reality TV and tuned into some real-life drama by real-life people? This is a challenge for all of us before it is too late.